Run by Ajit Tapaswi and Maud Chuffart, The Yoga House is a little oasis in the middle of bustling Bangalore where you can learn yoga, enjoy delicious healthy food, buy products sourced from the villages of India…or just find peace. Travspire had the pleasure of speaking with Ajit Tapaswi and Maud Chuffart, the owners of The Yoga House (TYH), a little oasis in Indiranagar, Bangalore. We absolutely love this place – we’ve been working out of here, taking their yoga classes, eating their delicious food and enjoying their hospitality. Born and brought up in France, Maud was a dancer (modern jazz) and a gymnast before she first started yoga in New York when she was 18 years old. Thereafter, she began learning the scientific Iyengar form of yoga from her Iranian teacher Maryam Askari in Paris. Her love for yoga led her to quit her job as a public relations consultant in October 2011 and move to Mumbai, where she met Ajit shortly thereafter. 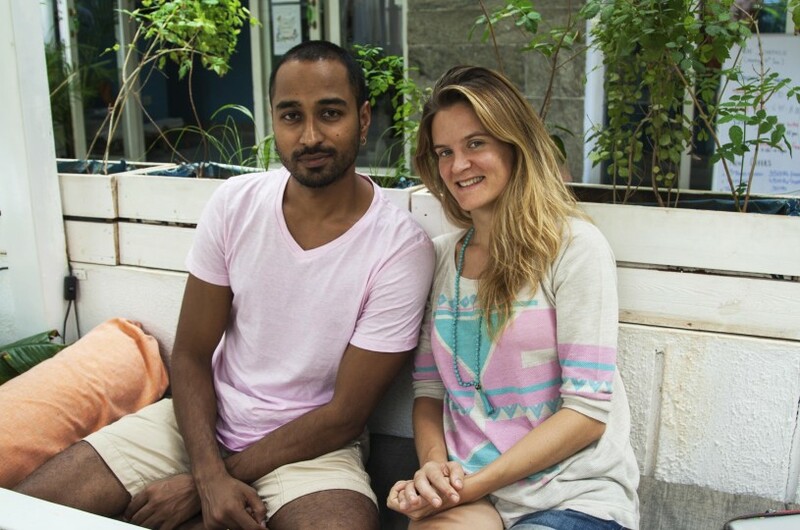 Maud and Ajit created TYH as a place where people can not only practice yoga, but also socialise. “Often people finish a class and want to socialise after, this is a space which lets them do that,” Maud recalls how TYH came about. In fact, it is now more than that – TYH has a very holistic approach to healthy living – in addition to the yoga studio, it has a health food café, a library and a boutique selling items such as yoga mats, clothing, natural skincare products, kulhads and jaggery. The space is incredibly calming – the white walls, sheer white curtains, light green and blue walls and neutral décor all contribute to this effect. At the TYH Bandra, people must take their shoes off before entering the premises – “people leave their ego at the door when they take off their shoes,” Ajit notes. There are various styles of yoga being taught two times a day – at 7.30am and at 6.45pm – catering to early birds as well as those wanting to unwind after a busy day at work. The studio is situated upstairs and is just so calming – I took my first ever yoga class in India with Ajit and was remarkably impressed – the emphasis was on breathing and mastering posture – the very basics of yoga that you need to get right (as Ajit stressed multiple times during class). I also loved TYH’s concept of rotating its teachers – I took classes from both Ajit and Arun and it was really interesting to see the difference in style – and visiting instructors such as Perrine who was here for a couple of months. The menu is vegetarian and a mix of continental and Indian items, no doubt influenced by Maud’s French roots and Ajit’s Indian heritage. The menu follows macrobiotic principles and was created with the help of Chris Clark, an American health science chef. Often, recipes would be created on the fly – Maud may be in the kitchen and give suggestions to the chef and a recipe would be created. The food is certainly a highlight – all the ingredients are fresh and cut on site. Having had the privilege of trying a variety of dishes over the last two weeks, my favourites have been the homemade granola, vegetarian brown rice paella, the travellers plate, the pink juice (watermelon, pomegranate and rosewater) and the masala chai with three ladoos. The chai here is delicious, particularly as they serve it with a small bowl of jaggery instead of sugar. TYH dispels the myth that healthy food is not tasty – the food is delicious and you will truly feel detoxified after eating here for a few days in a row. Ajit and Maud do everything themselves here – they designed the place and sourced everything personally by travelling to the villages that make them – from the cushions to the kulhads to the skincare products. It’s clear a lot of love has gone into creating TYH – one afternoon, I saw Ajit doing a bit of handiwork with the staff on the property. The attention to detail is striking – as Maud and Ajit explain, they do not use plastic but glass bottles for water so it is unaffected by chemicals; use glasses made of tin and copper (tin on the inside) due to the minerals contained in tin; and use clay kulhads for drinking chai. While Maud and Ajit are currently busy working on the new Bangalore space, they are thinking about what’s next – perhaps Pune or Goa…stay tuned. If you’re in Bangalore, make sure you visit TYH – you will be surprised by the peace provided by this little oasis in the middle of the city and by the hospitality of everyone from the owners to visiting instructors to the wait staff. You’ll feel right at home.